Denim is and continues to be one of the biggest trends in the last couple of years, fashion-wise. It is not only about jeans (pants) and denim jackets anymore. And in the Summer, denim isn't left just for shorts and mini skirts. Denim and Chambray Dresses have been popping up everywhere, from places like Forever 21 and H&M to more expensive brands like Topshop, Banana Republic, Calvin Klein, J.Crew and Ann Taylor. Denim and Chambray Dresses have become the "IT" thing to wear this Summer. 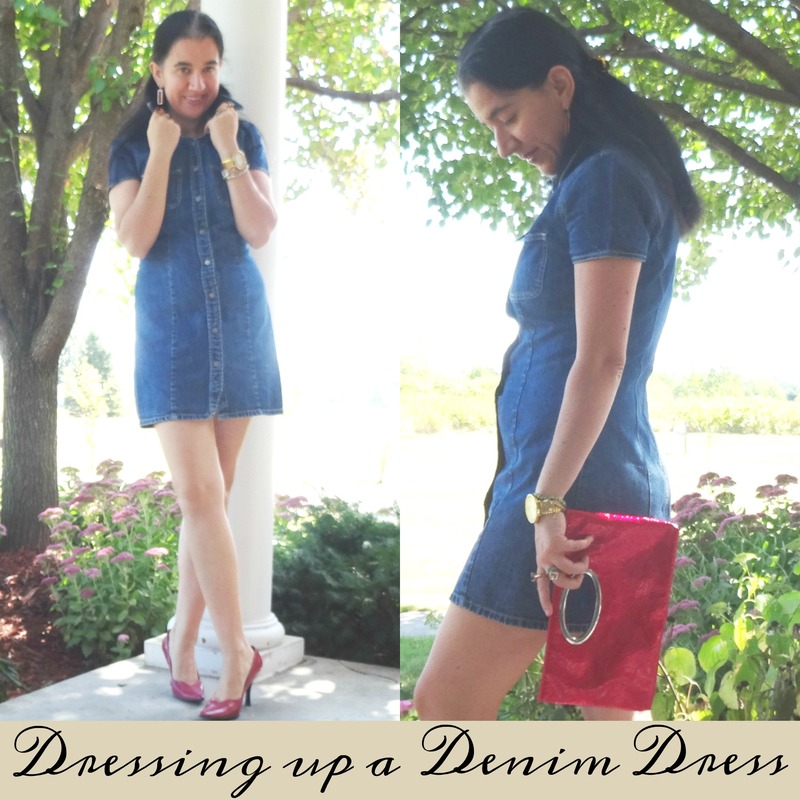 I have added a few new Denim+Chambray Dresses and I also found the perfect Denim Shirtdress. However with today's look I shopped my closet. This Sturdy Blue Denim Mini (Shirt) Dress from Gap has been in my closet for close to a decade. And we all know Gap does denim right. I shopped my closet for all the other pieces too: the Pumps (I have had for exactly a decade), the Clutch, and all the Jewelry and Watch. Because as much as some trends come and go, others stay and in my book denim isn't as much a trend as it is a life-style, an everyday basic. 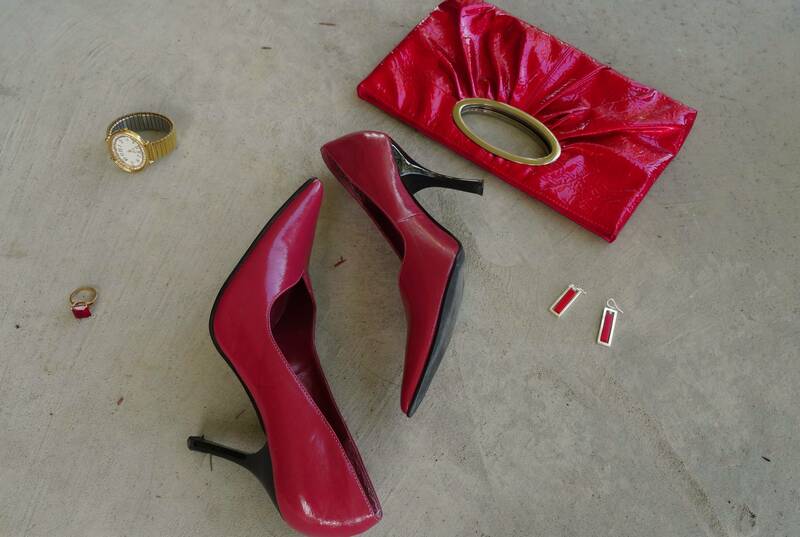 I decided to dress up my Mini Blue Denim Dress by pairing it with miss-matched yet that go together Patent Leather Accessories: Raspberry Pink-ish Pumps and Bright Red Clutch. Do you own a Denim Dress and how are you wearing it this Summer? Gold-Tone, Wide Chain Link Watch w/ Large Oval+Crystal Pave Frame: Avon (similar, Steal), (similar chic option, Fantastic Deal), (similar round watch, small Splurge, love this), (similar gorgeous option, my Favorite, Splurge). Strawberry Red/Hot Pink Patent Leather Pointy Toe Pumps w/ Black Heels: Mervyn's California (similar, Steal), (similar), (similar in neon pink, on Sale, my Favorite), (similar, Splurge). Bright Red Patent Leather Clutch: Express (similar, Steal), (elegant option, Fantastic Deal), (similar, Great Deal, my Favorite), (similar studded option, Splurge). Silver-Tone Skinny Rectangle Drop Earrings w/ Red Plastic Stones: The Limited (similar, Steal), (similar, bold statement earrings, Great Deal, my Favorite), (similar, Great Deal, love these). 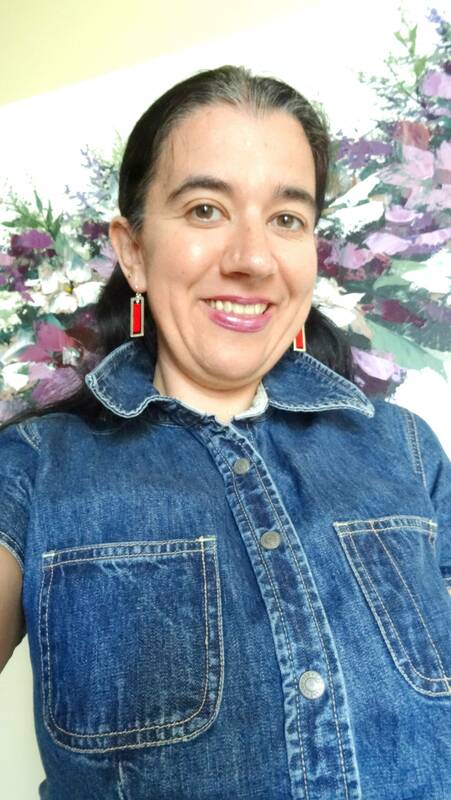 Medium-Wash Denim, Short-Sleeve Mini Shirt-Dress: Gap (similar, Steal), (similar, Fantastic Deal, love this), (similar, Great Deal), (long-sleeve option, Splurge, my Favorite). Sometime in August, I plan on doing an entire week of Denim and Chambray Dresses on the blog and (another) week of Little White Dresses since I have others you have not seen yet. For now, let's recap the fourth and last week of Dresses from June - the LWD (the Little White Dress). These are the 6 White Dresses I wore this June. Which one is your Favorite? I think the Ann Taylor Midi Shirt-Dress and the Tiered Silky 3/4-Sleeve one are my favorites and I also love how I styled them. And check out my collection of LWDs from last year.